I’ve made a lot of silverware wind chimes over the years, and with warm weather hopefully coming some time soon I was wracking my brain trying to come up with a new version. One day I was sitting and looking out the living room window contemplating my options while looking at my garden cafe with all its spray painted pieces… and an idea came to me. A spray painted silverware wind chime. It’s something I’ve never tried, and I’m always game to try something new. 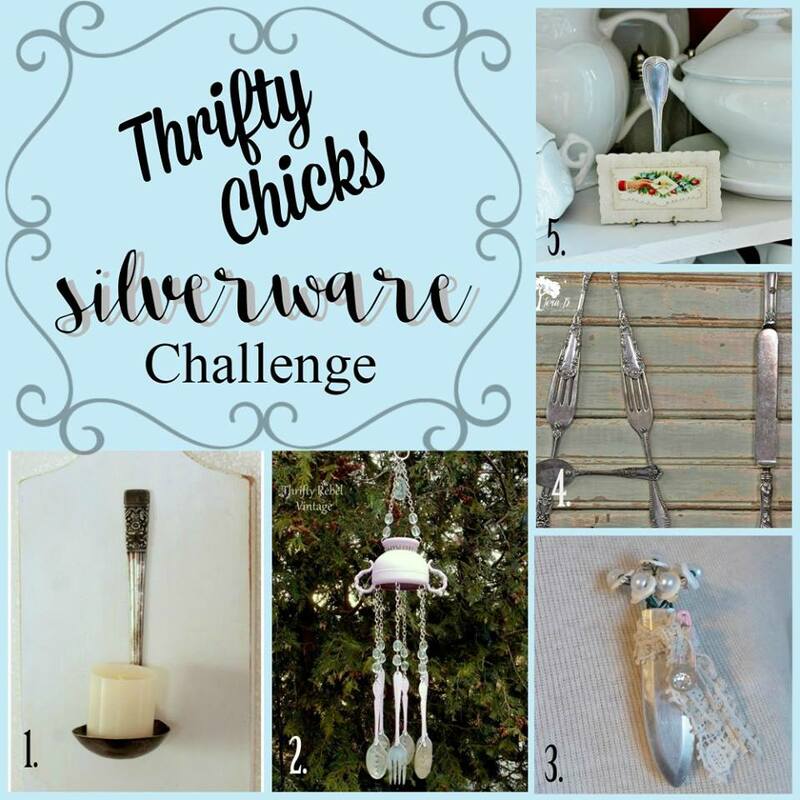 And just in time for the Thrifty Chicks Monthly Project Challenge, which this month is silverware. 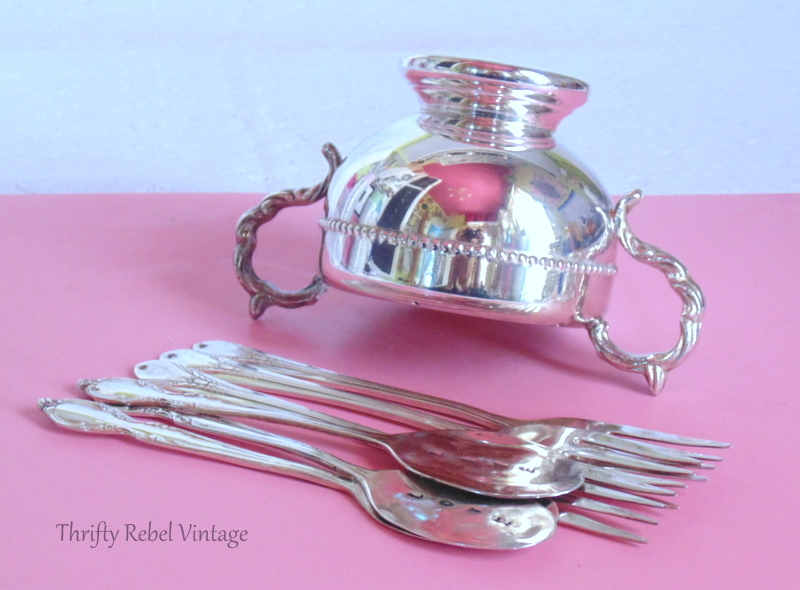 I’m so excited to see what my blogging friends have come up with for this month’s silverware challenge. 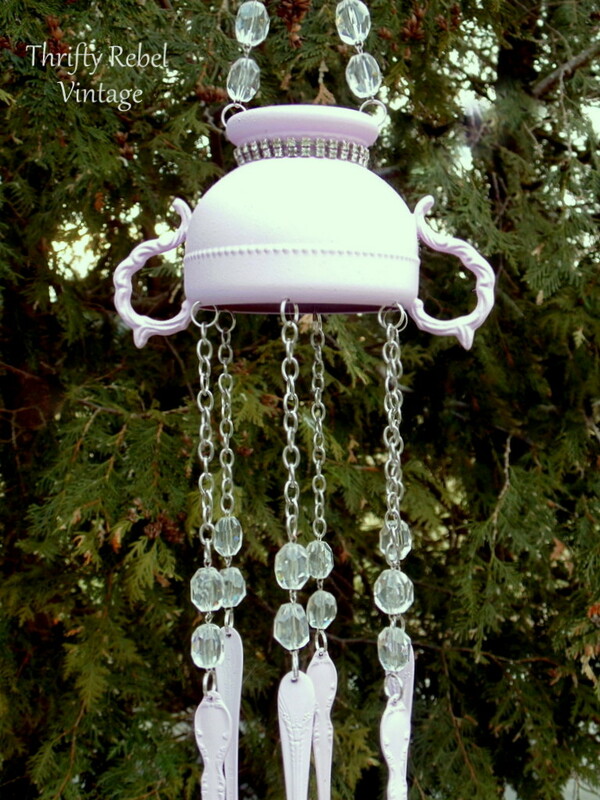 To create this chime I pulled items from my wind chime supply stashes. 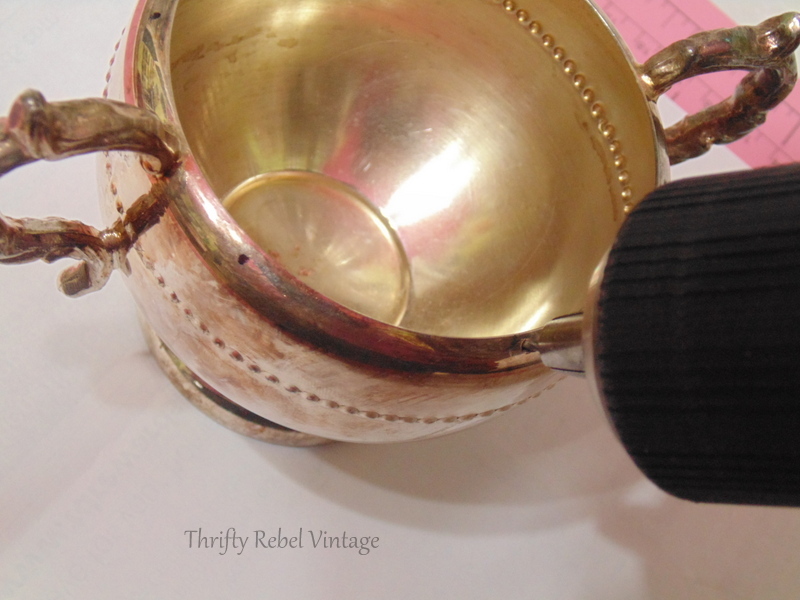 The first thing to do is create the holes in the sugar bowl. To do this I wrapped a sewing measuring tape around it, and marked where I wanted my holes to go. How many holes you need depends on how many chimes you want to hang. I’m hanging 6 so I spaced the holes accordingly. The I used my drill with a 1/16″ metal drill bit to drill in the holes. I also did this for two holes at the top to hang the whole chime. Always wear safety glasses whenever using a drill, but it’s especially important when drilling into metal like this. I gave my sugar bowl and silverware a good polishing. I’m not sure this is necessary, but I wasn’t sure how tarnish would affect spray paint. I have a stash of spoons and forks that I’ve already flattened, hand stamped, and drilled holes into. I do a bunch at a time so I always have some on hand. To learn how to do this yourself check out this hand stamped bookmark tutorial. 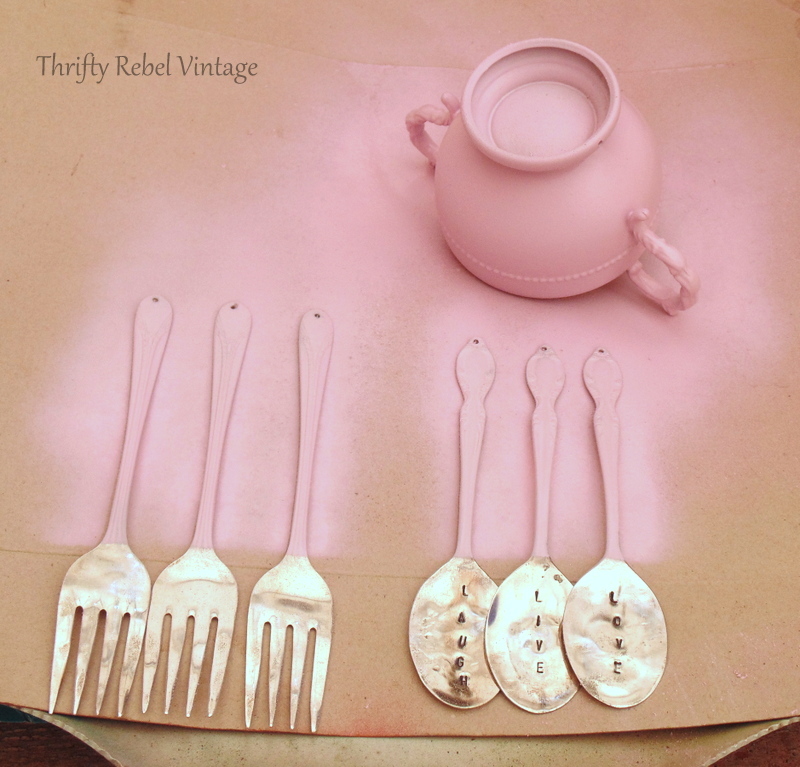 I took them out to my portable garage and gave them a couple of coats of a pretty pink chalk spray paint, doing the front and the backs of the spoons and fork handles. To me they look like they’re been dipped in pink prettiness. I divided the necklace into size parts, and added split rings to each end. 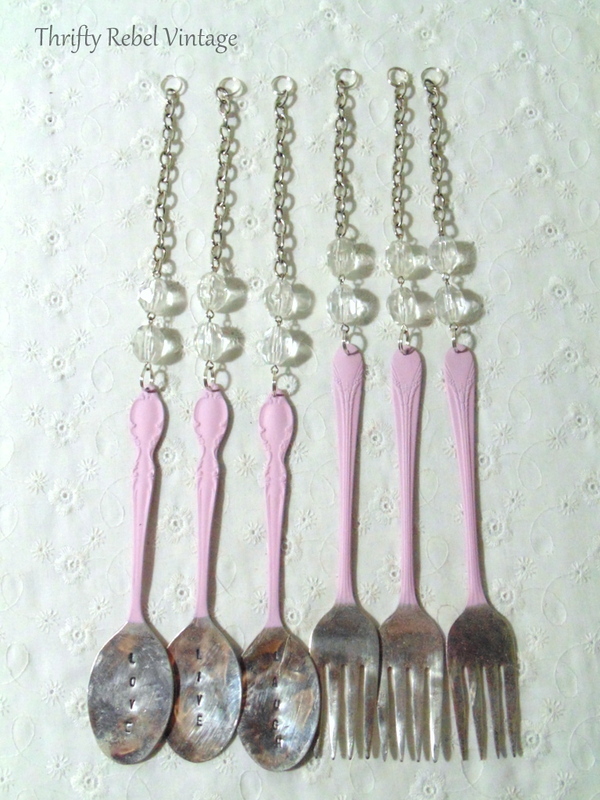 Since the forks are a little longer than the spoons I made those chains a little bit shorter so they would hang at the same level. And I attached them to the spoons using the split rings. And them I attached the split rings on the other end to the sugar bowl. The silverware looked unfinished to me so I decided to bling it up a bit, because who doesn’t love a little bling, by adding some faux aurora borealis rhinestones from a bracelet. I just used teeny dabs of E6000 glue, and added the rhinestones to both sides of the silverware so no matter which way the wind blows them they’ll always look good. 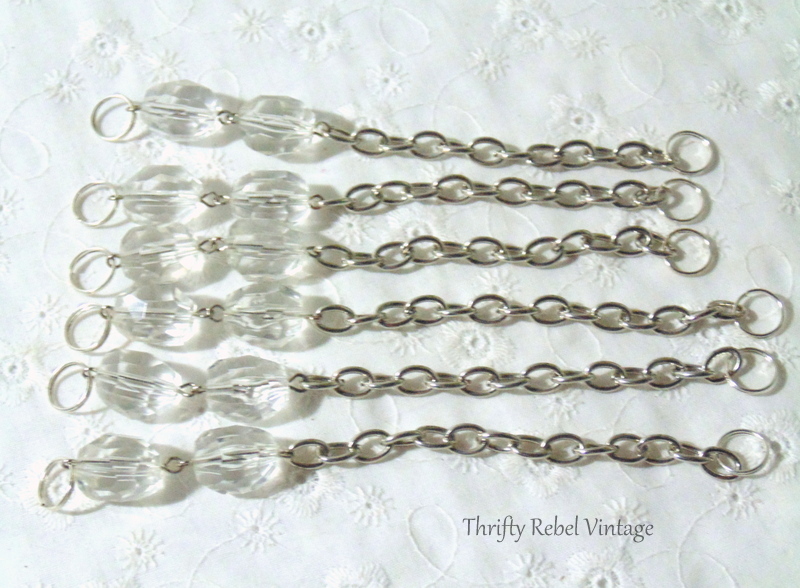 When I took the necklace apart I saved two pieces to hang the whole wind chime, and I attached them with split rings. The sugar bowl looked a little plain to me so a little more bling to the rescue with part of a faux rhinestone bracelet… again glued with E6000. I love repurposing thrifted necklaces for hanging chimes. It makes every wind chime truly unique. I decided not to spray with a top coat because I’m curious to see how the weather will affect the paint… if at all. 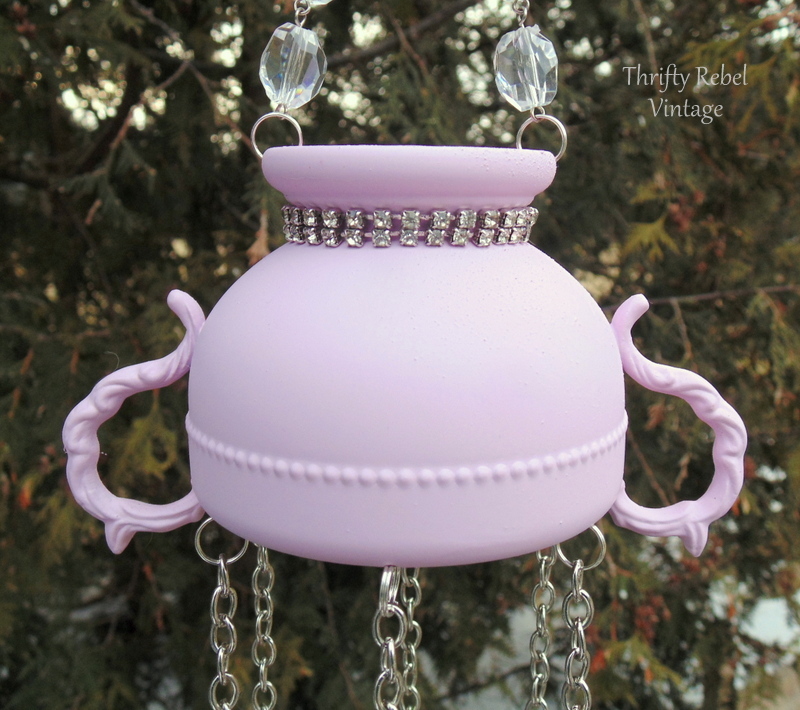 Once winter is no longer threatening here, I’ll hang my pretty in pink wind chime outside on the back deck and keep it out until fall… and I’ll be sure to share how it did. Of course you could always put it on a covered porch or deck to shield it from the weather. The whole chime hangs from a 1″ key ring, a nice thick one that can take the weight. And I always finish my chimes off with a chandelier crystal at the top because I have a stash of them, but you could use anything you have. So I hope you enjoyed my spray painted silverware wind chime. 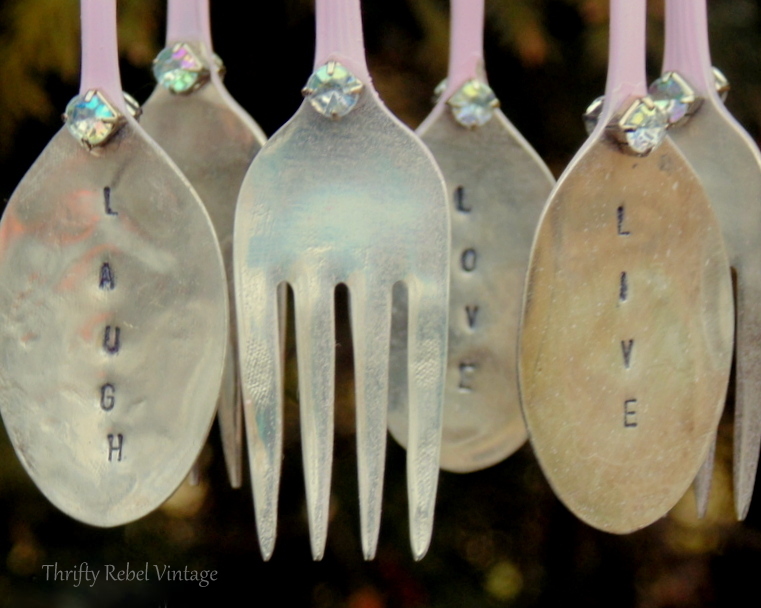 Now be sure to check out what my friends did with their silverware projects. Just click on the links beside the blog names below to check them out. This is so pretty. Your experiment worked. It is going to be so lovely when the sun makes the jewels sparkle. Really, really pretty! 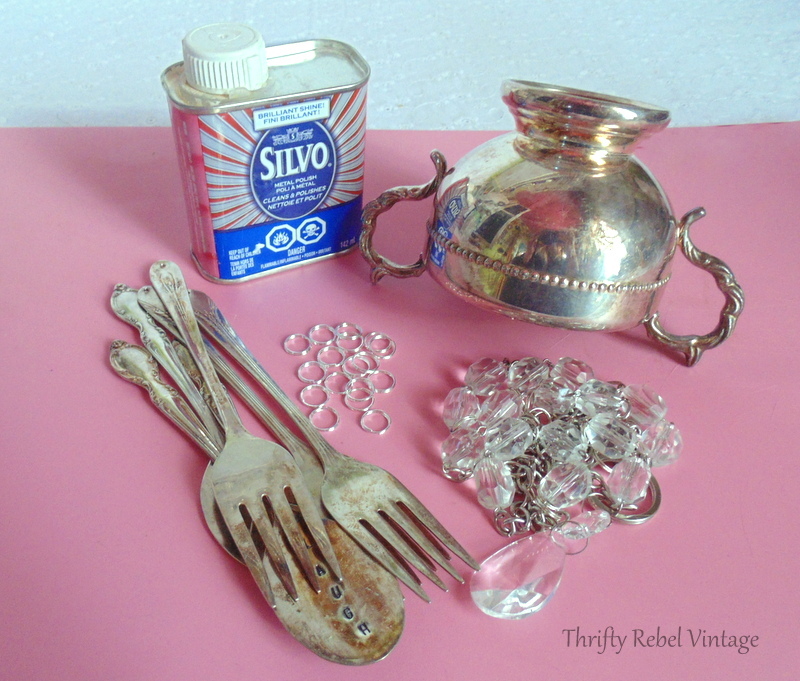 I have plenty of old silver ware, just need to find something to hang it on! Love your posts! Thanks Mary! 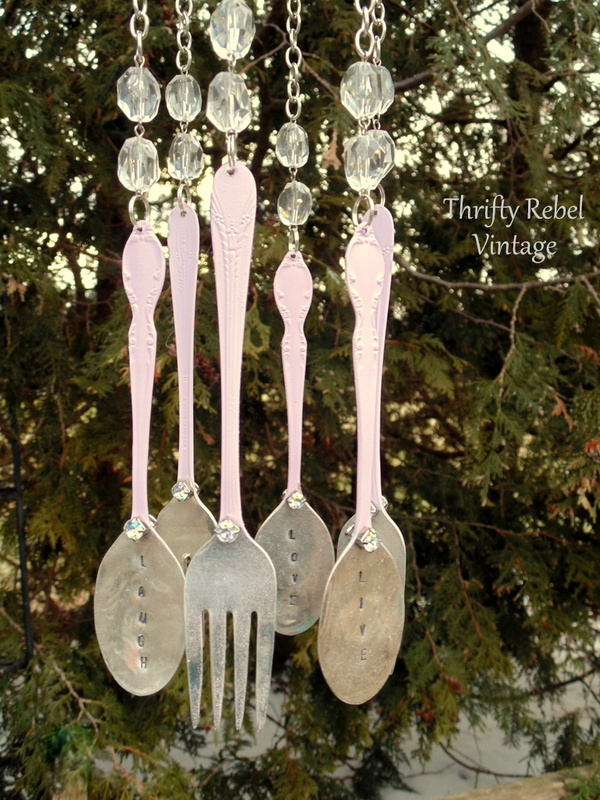 You can hang silverware from almost anything, and that’s what makes creating wind chimes so much fun. Thanks so much Debra! Now warm weather just have to get here so I can enjoy the sparkle. That is so imaginative. Have missed your creative projects.take care. Thanks so much Charleen! I’m so looking forward to doing more projects when the warmer weather gets here. I love it!! I love the bling you added. Thanks AnnMarie! I think almost everything can use a little bling. Thanks Nancy! I think a little bling is always fun, and it adds some sparkle. 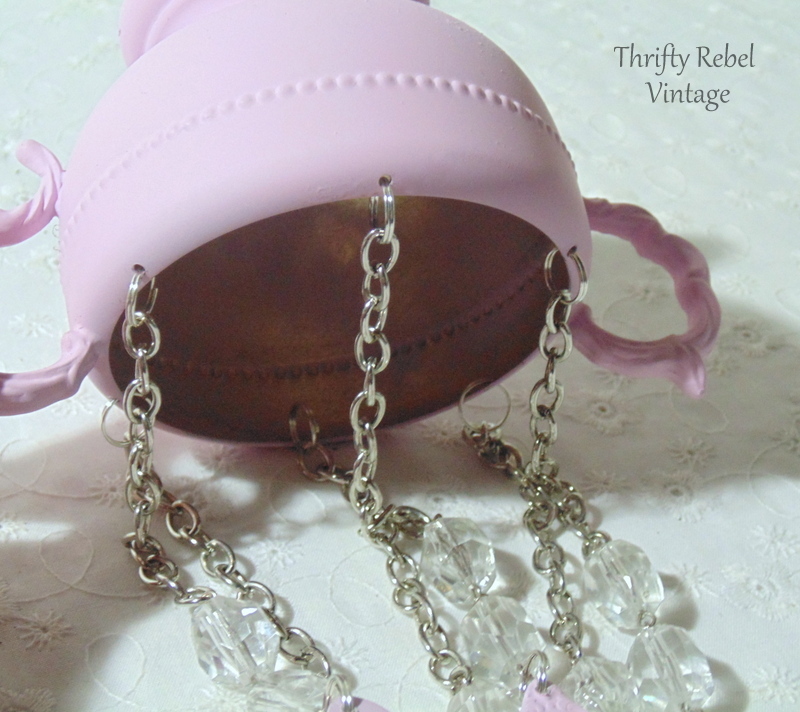 I love them hanging from the sugarbowl! And love how you stamped words on each; adorable as usual;) Pinned! Thanks so much Lora! 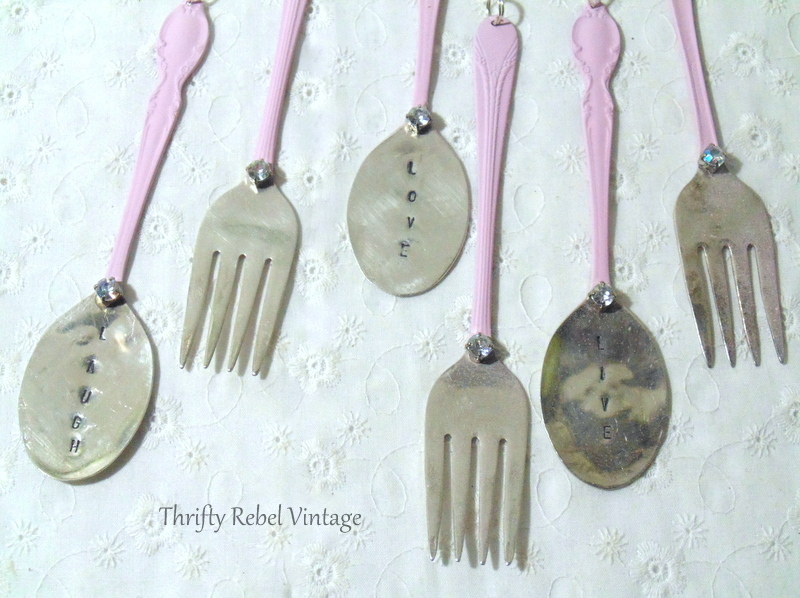 I do love stamping spoons, and it’s easy to personalize chimes too. Another so cute project. I don’t think I have the oomph to pound the silverware flat! Should keep my eye out for some silver plate, though! Thanks Kathy! The silver plate spoons are pretty easy to flatten. Much easier than stainless steel. I only use silver plated cutlery because it’s softer and can be drilled and stamped much easier too. This is so sweet tuula! I love the spray painted silverware handles and stamped words! Thanks so much Tania! This was such a fun challenge. Thanks very much Diana! This challenge really made me push myself to find another wind chime idea. This is so pretty! I would love to make something like this. You have such a knack for knowing what works good. Thanks so much Debra! It’s all about trial and error, and just figuring it out as I go. Thanks very much Marie! I love these challenges because they push me to create things I might not necessarily think of. Thanks for sharing! Tuula, you’re always a master at creating the wind chimes, and it’s something I admire & want to emulate. Love the pink! (Pink is my fave color.) You always inspire me with your projects. Love the use of the bling too. This is so pretty Tuula. Love the pretty colors and the way you have put it all together. Now I am thinking of an old colander I have which can be used in the same way. Thanks for the inspiration. Thanks Mary! I have made colander chimes too and they work quite well. There are so many things that can be used to make wind chimes. The possibilities are really endless. How fun and funky Tuula! I love your silverware wind chime. Thanks so much for sharing at Talk of the Town. Tuula, you are the Queen when it comes to repurposed windchimes–LOVE this one! 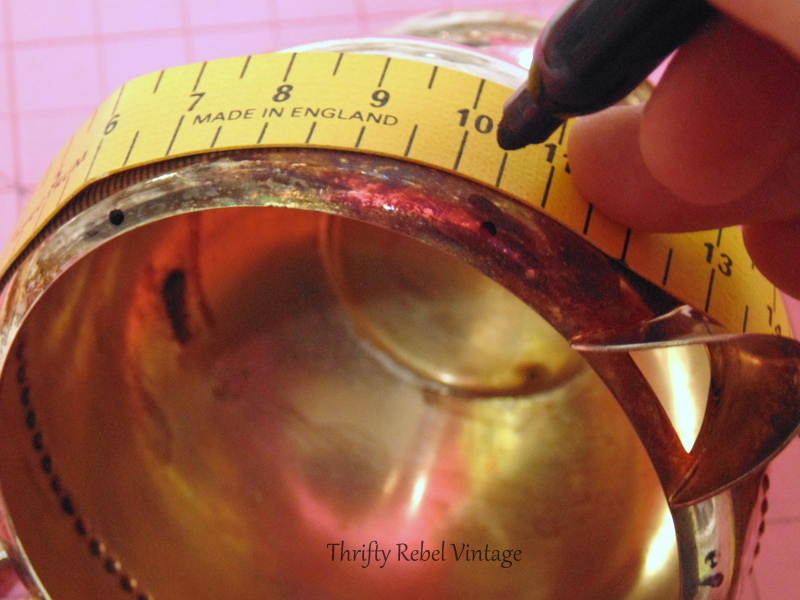 Thank you for sharing at Vintage Charm. Pinned! I love this! The pink is so pretty and goes so well with the silver. I’m curious to see how it weathers. I’m a big fan of your other wind chimes that are all silver. The sugar bowls are always so pretty. If you’re going to make more of the colored version, I would be curious to see just a band of pink around the top of the sugar bowl, so you can still see some of the silver as well. Just a thought. Thanks for sharing! Oh, will you be bringing back the “What the heck is it?” segment? I always get a kick out of it and the many responses. Hello. 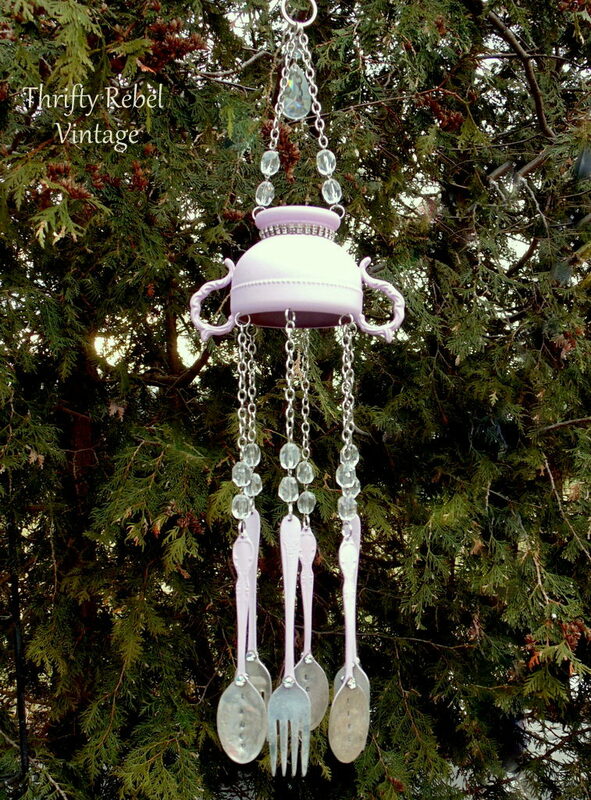 I love the sugar bowl windchime! I love how it all came together and how the bling played a big part in stepping it up a notch. Sooo sweet, Tuula! My sister loves wind chimes and her birthday is in July sooooo, me thinks I have the perfect gift idea! Thanks as always for sharing such great ideas! !